I keep writing about the importance of coming to Japan to train. Each time, there is something new to learn, and to bring back home. Often this “something” is hidden in plain sight, in the middle of a regular class. That was the case yesterday night during Noguchi sensei’s class. We were covering the first level of the Gyokko Ryû: Kokû, Renyō, Gyaku Nagare, Dan Shu, Dan Shi, Hanbō etc. As always, Noguchi sensei was recreating the waza we all know with his special twist. Refreshing and full of new insights. We reached the end of the Ten Ryaku no Maki. (1) Everything was fine until that moment. Then, Noguchi sensei said: “there are 3 jûmonji, one for each level.” And putting his words into action, he demonstrated them. I have been training with Noguchi sensei as my main teacher since 1993, (2) and yesterday was the first time I saw that. And, believe me, we have been going through the Gyokko ryû syllabus many times during my sixty trips to Japan. I never saw that before. I immediately went to him with Juan-manuel, Eugenio, and a few others. Noguchi sensei, notebook in hand, went through the densho showing the texts of the techniques. I told him, that it could be some Ramen recipe book so none of us could read Japanese. He laughed but continued his explanation. In the Ten Ryaku, the Jûmonji #1, is the one we know. Uke attacks right, then left. This is the one we do in the Kihon Happō. Uke attacks Tentō kiri with the Shotō. You move away low and to the left at 45° and dodge the attack. At the same time, you hit your left thigh with your hand to trigger a whiplash jump that thrusts you forward into uke’s face, that you shutō vertically. Uke steps back from the hit, and launches a second attack. This time, you do Ura Uke Nagashi, do the same slapping on the right thigh, and the same hit to the face, but with Migi shutō. You apply Sayû (3) Uke Nagashi to the arm, step in with Te Dama Dori (4), and by hitting Sayû boshi ken to Butsumetsu. Noguchi sensei precised that the hits were done twice on the same spots, double hits on the forearm, and double hits to Butsumetsu. This class made me think a lot. On the way back to Kashiwa, I was speaking with my friend Sveneric, he said that he saw this done once in the past. But we agreed to say that it was the first time, we clearly saw the link between the three levels of the school. These last five minutes of the class were an eye-opener. A) How come this is not detailed in all the notes I have been collecting and training for the last 30 years? C) How come I didn’t see that before? I guess I’ll have to come back again, and ask about it. Training in Japan, when you’re ready to destroy your certitudes, is a fantastic way to keep your progression in budô alive. Too often, practitioners come to train in Japan, but they come here only once in their life, and behave as if they knew everything. I don’t get it. I’ve been coming here for more than 25 years, and I’m still puzzled by my lack of knowledge. 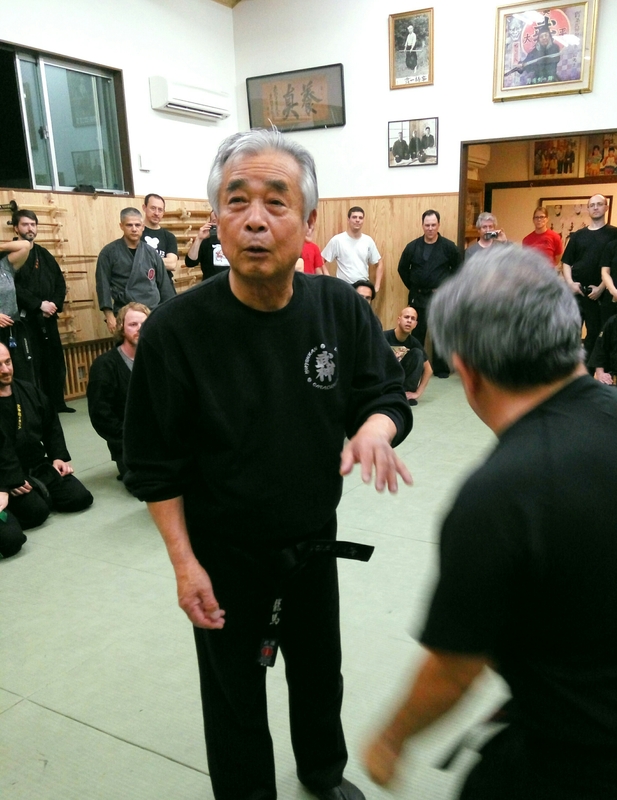 There are no secrets in the Bujinkan, everything is “hidden in plain sight”, and it takes a very long time to be able to see it. Linking this to my previous post, the Omote Waza is nothing compared to the Ura Waza. 1. The Ten Ryaku no Maki is sometimes called “Jō Ryaku no maki”, sometimes “Shōden no Kata”. Hatsumi sensei used the three names over the years. 2. In 1993, Hatsumi sensei told me: “Arnaud from now on, you train only with me and Noguchi.” Only in 1997, when the old honbu dōjō opened, was I allowed by Sōke to train with all the Shi Tennō at the honbu. And not with anybody else. I obeyed, and never asked him why he ordered me that. More than twenty years later, it transformed my taijutsu to resemble Noguchi sensei’s taijutsu. Noguchi Sensei taught the three forms of Jumonji from the Tenchijin Ryaku no Maki back in 2008 during his KIhon classes.